We’ve been in the indoor and outdoor sports flooring game for more than 15 years. Low costs, easy maintenance, and unparalleled safety features are Sport Court Carolina’s specialities. Our quality installations surpass the expectations of even the most demanding coaches, athletes, builders, architects, and facility owners. We take care of the details so that you can focus on the game. 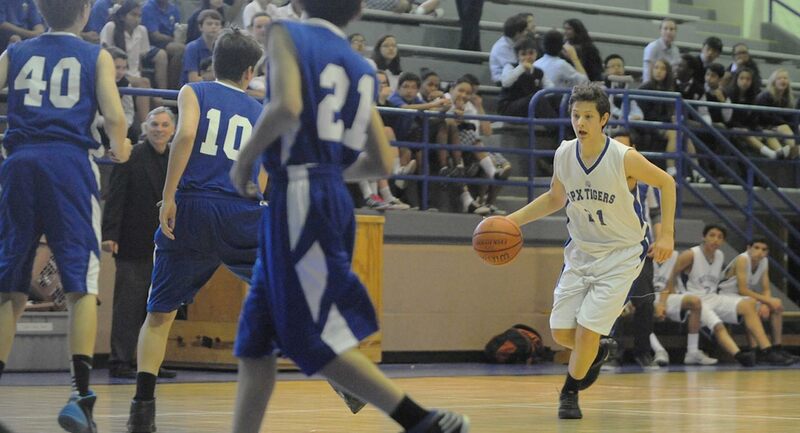 Sport Court Carolina love the game as much as you do. We put as much love and care into the developing of new technology for your court. Let us turn your unused field or existing concrete court into a showpiece your community will be proud of, a place where both young and old can safely play. Sport Court Carolina offers Outdoor Courts for a variety of sports like, basketball, tennis, pickleball, soccer, lacrosse and more. Low maintenance. Dry mop and occasional auto-scrubbing is all you need. Sport Court Carolina has built gym floors and outdoor courts for many facilities across North Carolina & South Carolina. "Our entire family has a blast playing tennis and basketball and we realize how much ‘together time’ we had been missing." "I wanted to let you know how much we love our Sport Court. At least one of our three kids uses it every day. I promise I'm not exaggerating—we use it every day." How do Sport Court floors compare cost-wise to other alternatives? Sport Court modular flooring provides durability and multi-sport playability at an affordable price. Sport Court is typically less expensive than even basic suspended wood systems, and competes well against most other synthetic alternatives. From a life-cycle cost perspective, low maintenance costs and long-term durability make Sport Court the smart budget choice. Unlike wood and most synthetic floors, Sport Court’s modular systems are virtually unaffected by water, whether in vapor form emitting from concrete slabs or sub-surface, or even (in most circumstances) in case of flood or submersion. Many Sport Court floors have been used to retrofit other systems damaged by flooding (and where the possibility of future floods exist). The polypropylene used in our modules is impervious to water damage. No. 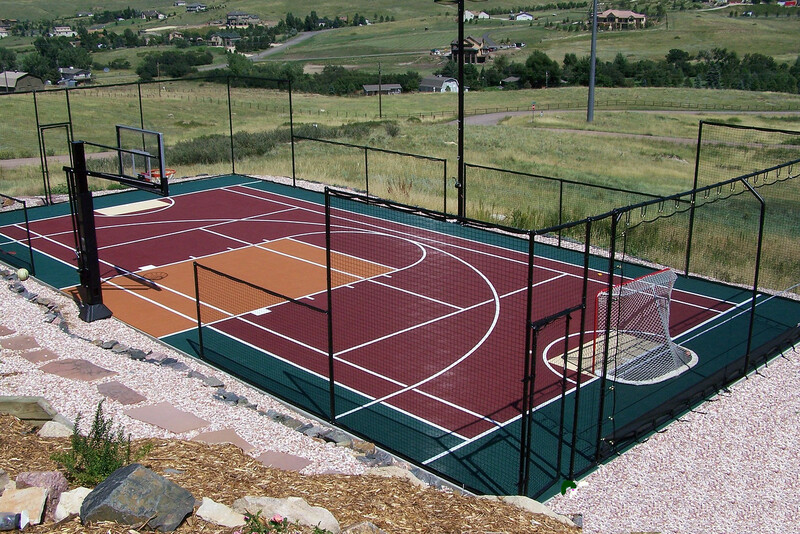 Sport Court products meet all safety standards and contain no hazardous chemicals. Some paint and coatings require ventilation during application, but leave no harmful residues or compounds behind. In fact, Sport Court is the only ISO 14001 sports flooring manufacture in the United States—the international standard for environmental controls. Sport Court modular sports floors can be produced in almost any color you desire. In addition to our standard palette of over 20 stock colors, we can also design to your color specifications, to match school or other desired color schemes. In addition, we can create unique logos and other designs to personalize your floor, or utilize different-colored sections to help you establish your activity schemes and teaching curriculum. What makes Sport Court different from others? 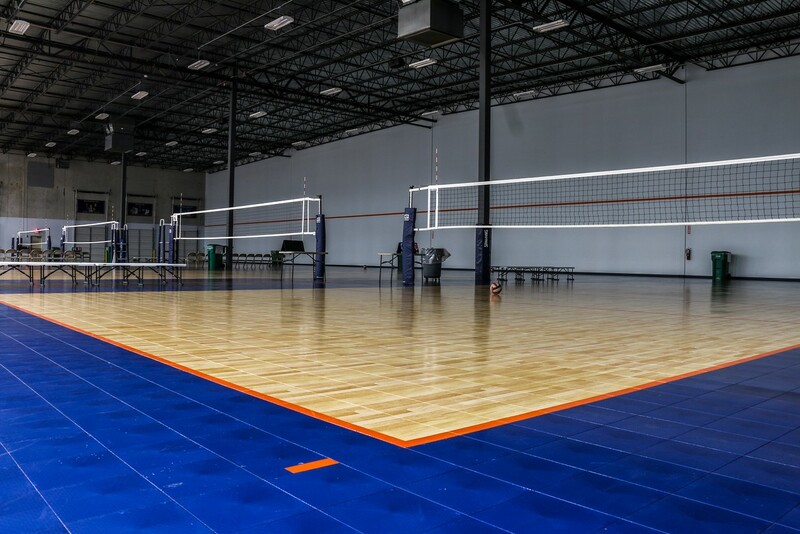 There are many available options when it comes to indoor flooring, but few offer the versatility and multi-purpose applications of Sport Court. We have a few competitors in the modular field, but the most they can claim is that ‘they’re like Sport Court’—no one else has the history of pioneering and creating unique, playable, and safe surfaces for sports. And compared to wood and other synthetic sports floors, no other product delivers more for less, or can be used in as wide a variety of applications. Whether for new construction of retrofit, Sport Court flooring can typically be installed, striped, and ready for play in less than a week. Sport Court modular sports floors are covered by a 15-year limited warranty, and we expect them to deliver playability, safety and durability for at least that long. Sport Court modular floors are among the safest in the world. Our patented Lateral Forgiveness™ provides protection against the stresses on limbs and joints, and we can adjust the shock absorption values to almost any level desired. Ball response is one of the performance characteristics governed and measured in the DIN standards, which are the acknowledged metrics for basketball floors. DIN-certified basketball floors must deliver at least 90% ball response, and Sport Court modular surfaces typically range between 93% – 100% ball response values. Sport Court modular surfaces are easily and inexpensively maintained compared to most other sports surfaces. Regular dust-mopping, and intermittent deeper cleaning with a mop or auto-scrubber are typically all that is required. Our High-Gloss™ floors, with a durable polyurethane coating, can be field-maintained every three years by your Sport Court Dealer, typically requiring one day of application and 3 – 4 days before active play. Most sports surfaces have limitations. Wood floors require costly field renovation and maintenance at least annually and can be easily damaged by water. Most synthetic surfaces must be glued down and can delaminate or be affected by ground water or vapor emission. Sport Court modular surfaces can be used for almost any activity, in almost any type of facility, whether climate-controlled or not. They are durable and resistant to damage, but their modular nature makes repairs simple and quick when necessary. For facilities watching their maintenance budgets, Sport Court provides a safe and playable surface with some of the lowest life-cycle costs in the industry. Why are some of the other modular products cheaper? Sport Court was the pioneer in the industry of modular sports flooring, with nearly 40 years of experience. Some companies with injection-molding capabilities have jumped into the business, thinking that they only need to copy a basic module design to create a sports floor. However, not only do they lack our manufacturing expertise and discipline—Sport Court is the only ISO-certified modular surface manufacturer in the world—most of them fail to understand even the most basic concepts of safety, performance design, and applicability for sports. They can make plastic tiles, but the creation of a safe, durable performance floor is beyond their capability. As with most products, you get what you pay for.